We have explored hundreds of thousands of hypothetical individual gas clouds in the universe, which collapse gravitationally and crunch out new stars. That’s just an illustration of the way stars are formed. What is the distribution of stars and gas in the Milky Way as a whole? Detail of the birth of stars in the Carina nebula, focuesed on a pillar of gas and dust within which stars are forming. This is just part of a larger complex of star formation within a huge cloud of gas, a scenario played out in patches throughout the disc of our galaxy and other star-forming galaxies in the universe, wherever there is a reservior of cold, dense gas and the conditions are right for the thermonuclear triggering of star formation. The pillar is quite opaque, even to the intense light emitted by the new stars within it, but jets emitted by some young, massive stars within the pilar can be seen blasting lateraly out of the collumn, and the whole region glows with the light of ionized gases and scattered light. Star formation is an energetic process: radiation and winds from the most massive, young stars can dramatically alter and shape their immediate surroundings, and form part of feedback energy responsibe for regulating the growth of galaxies. As we know, the Milky Way can be divided up into its disc and central bulge — the virtual and the yolk, if you like. The disc of the galaxy is where most of the dense gas reservoirs responsible for forming new stars are located, and these are so-called Giant Molecular Clouds (GMCs). They are called ‘giant’ because they are large, spanning some hundreds or so parsecs, and contain enough fuel to form potentially millions of stars. They are ‘molecular’ because of the gas within them is primarily composed of molecular hydrogen, the simplest molecule, just two protons bound together by shared electrons forming a simple covalent bond. In order to form in the first place, molecular clouds must have ‘cooled’ from more tenuous gas where the hydrogen atoms were not yet bound together. We say the gas has ‘cooled’ because, for the molecules to form, those atoms must get close enough together so that they become bound via the electromagnetic force, and don’t simply zip by each other. This is the situation in host gas; the atoms have lost of energy if molecules and subsequently, stars are to form. At first, it’s a bit confusing to think that stars, which are a lot, form from gas that has cooled, but what we really mean is that the gas cloud as a whole has collapsed gravitationally, losing some of its internal energy so that fusion — star formation — can eventually take place in dynamically cold clumps. Once stars start forming within a cloud, the gas around the sites of new star formation starts getting blasted by the radiation and winds driven by those new stars. This backlash not only ionizes the surroundings gas, creating a glowing nebula like Orion but the combination of the radiation and winds blown by the stars starts to blow out bubbles and cavities within the GMC, affecting the distribution and chemistry of the gas. Thus the astrophysics at the interface of star formation and the interstellar medium is incredibly complex, meriting a dedicated field of astrophysics research. There are many GMCs spread throughout the galactic disc. If we could view the Milky Way from above, we would see many patches of red-hued ionized hydrogen and clusters of blue, young stars punctuating the spiral arms of the galaxy. We cannot get to this vantage point for obvious reasons, but images of nearby spiral galaxies that present their faces to use give us an excellent idea of what the Milky Way looks like from the outside. We measure the star-formation rate — or SFR — of a galaxy in the convenient units of the equivalent mass in Suns formed per year. The Milky Way has a star formation rate of just a few solar masses per year, and it’s important to consider that even after billions of years of evolution, the galaxy has not yet used up all of its gas, it remains an active place, albeit comparatively sedate compared to the most extreme galaxies in the universe, which I will come to. If we waited long enough and watched the evolution of the Milky Way, pretty much all the gas in the galaxy would be turned into stars, and the supply of gas from the surrounding intergalactic space — which gradually rains down via gravity — would turn into an insignificant trickle. A few tens to 100 million years later, after the last generation of star forms, the massive stars would die, leaving behind their longer lived but less massive cousins. The disc would eventually fade and turn from blue to red as the bluer spectral type die off progressively. 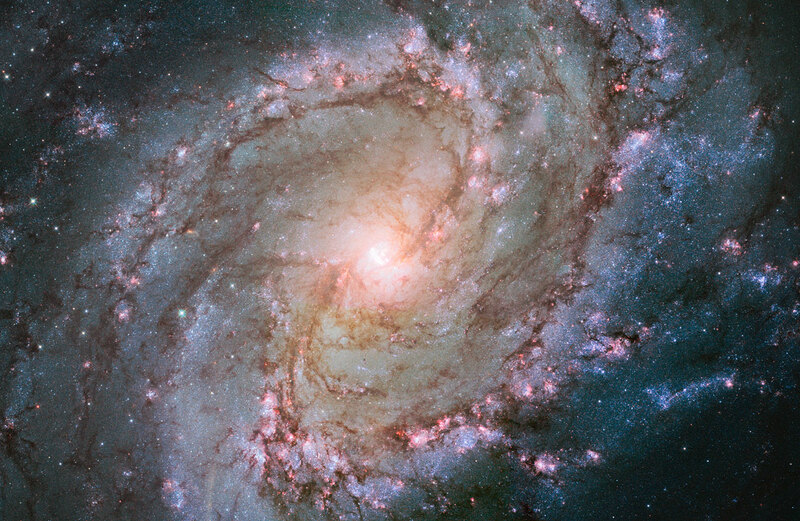 Such galaxies do exist and are called ‘passive spirals’. 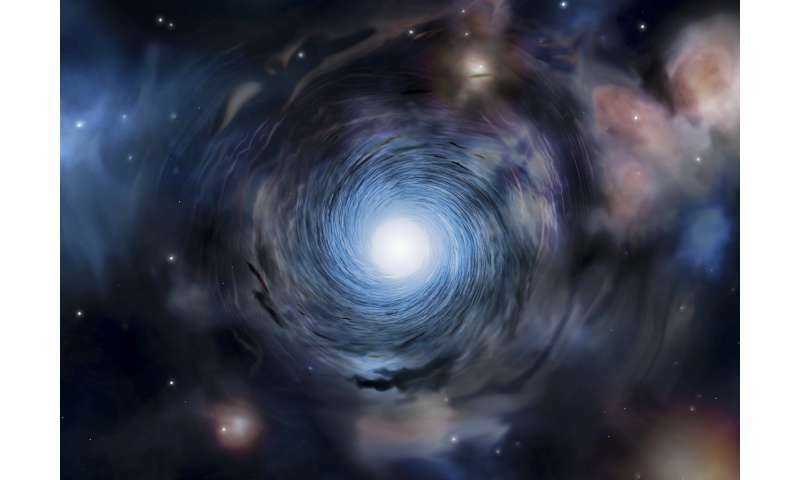 They are thought to be typical spirals in which star formation has ceased, either because of some environmental influence that prevents gas from forming new stars or because they have run out of fuel. On the other hand, if the Milky Way collides with another galaxy, as it will probably do with M31 in the future, there will be a violent event that could significantly boost the star formation rate. The strong gravitational tidal force will distort and tear the two galactic discs, triggering a burst of star formation in disturbed clouds, which are impelled to collapse from the gravitational perturbation. No stars will physically collide — they are so small and far between that the chance of individual stellar collisions when galaxies collide are very low. We see these starbursts happening in other galaxies that have recently collided; stellar discs are ripped into long tails, and there are patches of intense ultraviolet and infrared emissions, often towards the dense centre of the system. When things settle down, our galaxy will have changed chemically, dynamically and structurally. New generations of stars and the new solar systems that form with them will be enriched with elements that will literally have formed a long time ago in a galaxy far, far away. 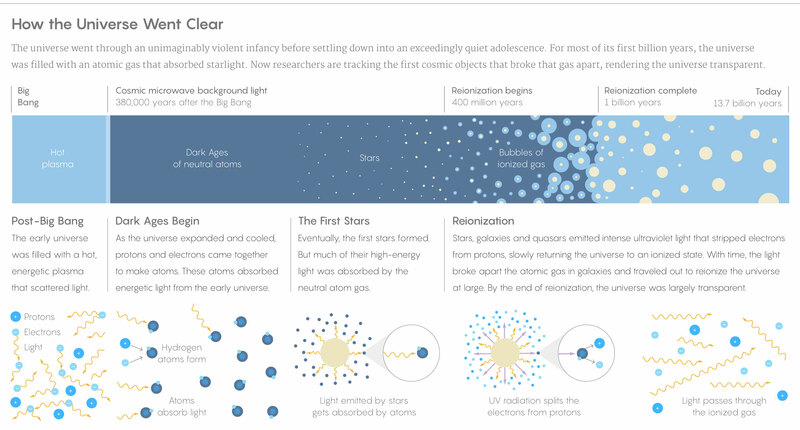 Galaxy collision is events that stir things up: they deliver new material and promote new growth. As always, the dense gas is where all the actions happen, but this gas is surprisingly difficult to detect. Most of the molecular hydrogen in galaxies cannot be observed directly, because for physical reasons relate to the structure of the hydrogen molecules under normal conditions it doesn’t emit radiation that we can detect. And yet molecular hydrogen is a fundamental component of galaxies, so how can we learn about the properties of the raw material for star formation? It’s easy to see the glowing, ionized gas around star-forming regions, but these are like burst-fires in a more expensive savannah. The majority of the gas in any one GMC is not actively forming stars. 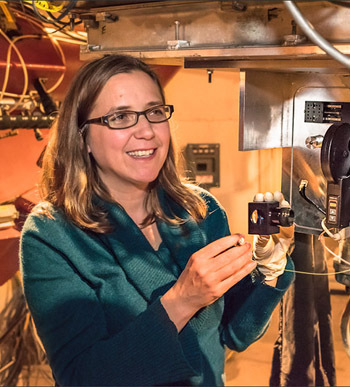 So, how do we measure and map the molecular gas? The answer comes from the contamination of that gas by previous generations of stars. One of the most common molecules in galaxies after hydrogen is carbon monoxide. This is the same stuff that is emitted by the poorly burning gas fires, and which you can detect in your home. Carbon monoxide tends to be mixed in with the hydrogen gas, which is extremely useful because, unlike the hydrogen molecules, it does emit radiation when excited into an energetic state. In this case, that energy is in the form of the simple rotation of the carbon monoxide molecules(Which are single carbon and oxygen atoms bound together.) This rotation can happen when carbon monoxide molecules collide with hydrogen molecules. Changes in the energy of quantum systems (like molecules) result in the emission of precisely turned radiation. At the molecular level, even the rotation of a molecule like carbon monoxide is regulated by quantum mechanics: only certain types of rotation are allowed. This means that carbon monoxide, when rotationally excited, emits radiation at regular intervals in frequency. Different frequencies of emission correspond with different energy states, the highest frequencies are emitted by carbon monoxide molecules in the most energetic states and vice verse. These energy states are dependent on the density and temperature of the gas. It takes gas densities of a few hundred particles per cubic centimetre and temperatures of a few tens of degrees above absolute zero to start emitting the lowest energy carbon monoxide lines. In context, the gas that is producing this emission is representative of the bulk molecular gas reservoir. Unlike the emission lines of ionized gas in the visible light part of the spectrum, the carbon monoxide emission has wavelengths of the order of a millimetre, between the far-infrared and radio part of the spectrum, so it cannot be observed with a normal optical telescope. Instead, we can use radio telescope equipped with suitable receivers that can detect photons of this wavelength. Once we detect the carbon monoxide emission, we can measure the total amount of light and convert this to carbon monoxide luminosity assuming we have some estimate of how far away the emitting gas is. Since the carbon monoxide emitting gas is mixed in with the molecular hydrogen such that the more hydrogen there is, the more carbon monoxide there is, we can convert the observed carbon monoxide luminosity to a molecular hydrogen mass. Thus, we can tell how much gas is available for star formation in a GMC, or indeed in the whole galaxy. Traditionally this has been quite a challenging observations for galaxies much beyond our local volume — the technology has not been available to detect the faint carbon monoxide emission from very distant galaxies apart from the most extreme, luminous galaxies like quasars. All this is changing right now with the development of a new telescope — or rather, an array of telescope — called the Atacama Large Millimeter Array (ALMA). ALMA is a collection of about 50 radio dishes [correction-66 radio telescopes], each 12 meters in diameter, spread over a large area of land in the high Chilean Atacama on the Chajnantor plateau, at an altitude of about 5 Kilometer. ALMA is an international project, with the major contributions from the USA, Europe and Japan. The magical thing about an array of telescope like ALMA is that they can be linked together electronically to act like a very large telescope, utilizing the light-collecting area of all the dishes and attaining very high spatial resolutions. This technique is called interferometry. ALMA is incredibly sensitive in the sub-millimetre and millimetre bands and, once it reaches full operational power, will be able to detect the molecular gas in galaxies not dissimilar to the Milky Way, but seen close to the start of the cosmic time. It’s an amazing leap forward in this area of astronomy and is ushering in a new era of exploration of galaxies that will yield fascinating discoveries for several decades to come. You might have heard about the molecular gas — the building blocks of stars — but it’s important to also consider the other major gaseous components of galaxies: the neutral atomic hydrogen, H1, which precedes the molecular phase. This H1 gas comprises single atoms of hydrogen rather than molecules of hydrogen. Unlike molecular hydrogen, the atomic component is more diffuse and is not restricted to dense, compact clouds trapped in the disc. The atomic hydrogen is incredibly useful as a tracer of the outer edge of disc galaxies. The atomic hydrogen is easy to spot because it is a strong emitter of radio waves. Not any old sort of radio waves, mind you — in the rest frame, the gas emits light at a frequency precisely 1.4 gigahertz, or equivalent a wavelength of 21 centimetres. Like the precise carbon monoxide emission from GMCs discussed before, and like those ionized gas emission line around star-forming regions we have talked about, the 21 cm emission from atomic hydrogen is also an emission line. This time the physics of the emission is slightly different again. 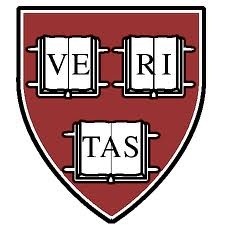 I’ll explain it because it illustrates two important things: one, the ridiculous numbers involved in astrophysics, and two, another nice link between quantum mechanics and astrophysics. Hydrogen atoms are made from a proton and an electron. In quantum mechanics, these particles have a property called ‘spin’, which doesn’t really have an analogue in classical physics but is a bit like a quantum angular momentum. 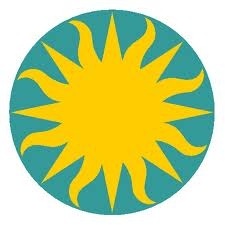 Anyway, the spin of the proton and electron can each be thought of as oriented up or down, so it’s easy to think of a bunch of hydrogen atoms, somewhere both the protons and electrons have their spins in the same direction (parallel), and some where the spins are in opposite directions which is anti-parallel. It turns out that the quantum state in which the spins are parallel has a little more energy than the state in which they are anti-parallel. A quantum system is lazy — it likes to be in the lowest possible energy state — so there is a mechanism by which those atoms with parallel spins can have the electron flip so that is spin points in the opposite direction to the proton’s spin. This is called hyperfine splitting because the difference in the energy between the parallel and anti-parallel states is tiny compared with the overall ground-state energy of a hydrogen atom. The energy that the system loses in this transition has to go somewhere, so every spin flip releases a photon with a very specific energy corresponding to the exact difference in energy between the parallel and anti-parallel states, which happens to correspond with electromagnetic radiation — a photon — with a wavelength of precisely 21 centimetres. The corollary is that neutral atomic hydrogen can also absorb radiation with a wavelength of 21 centimetres, where energy is absorbed by the atom and stored by aligning the spins of the electron and proton. Hyperfine splitting is called a ‘forbidden’ transition because, for any one atom, there is a very small chance of it occurring under normal conditions. In fact, the chance is so remote that if you observed a single hydrogen atom aligned in the parallel state and waited for it to undergo the hyperfine transition, you would have to wait on average of 10 million years for it to happen. If you observed 10 million atoms, then you would expect to see just one photon released per year. That’s still not much of a signal. In astrophysical scenarios, however, we can exploit atomic crowdsourcing, there are so many neutral hydrogen atoms in an astrophysical cloud of gas that the radio emission is really quite bright — since, at any one time, a huge number of 21 cm photon are being emitted via the hyperfine transition. I find this amazing — this is a probabilistic quantum mechanical release of a photon from a single atom that simply doesn’t happen on Earth, but when it is put in an astrophysical theatre it gives rise to one of the most important observations we have of our own, and indeed other galaxies. Again, like the carbon monoxide measurements, the detection of atomic hydrogen much beyond the local volume is difficult. Like all electromagnetic radiation being emitted by a source moving relative to use, the 21 cm line is subject to redshift, which stretches wavelength longer and equivalently makes frequencies lower. The rest-frame frequency of 1.4 GHz is already quite low. Make that lower still and it moves into a part of the radio frequency range that is quite difficult to detect. For one thing, below 1 GHz we get into the radio bands used commercially for TV and radio, and for communication. This manmade radio frequency interference dwarfs astronomical signals, making astronomical observations near impossible at frequencies that coincide with these ranges. Radio telescopes that want to operate close to the frequencies used for communication must be put in a location remote from terrestrial radio source in order to minimize RFI [Radio Frequency Interference]. The Earth’s ionosphere also affects the traversal of radio frequencies below 1 GHz in a similar way to how optical light is bent and refracted by a glass of water, and correcting for this is hard. 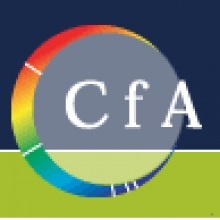 There are numerous other technical reasons why low-frequency radio astronomy is challenging, but many of these hurdles are now being overcome with the development of large antenna array coupled with extremely powerful computers that can handle the insane level of single processing that must be performed in order to distil astronomical signals in the radio part of the spectrum. One such recent example is LOFAR: the LOw-Frequency ARay for radio astronomy. LOFAR is an array of thousands of very cheap antennae, that actually just resemble black slabs, rather than the parabolic dishes that you usually associate with a radio telescope), spread over a 100 Kilometer region in the Netherlands, as well as stations up to 1,500 Km away in various parts of Europe. 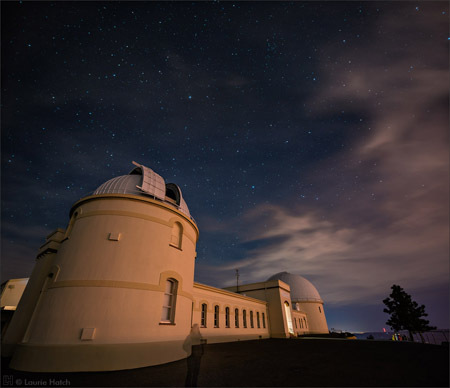 The telescope is designed to detect radio frequency of 10 to 250 MHz — suitable for exploring what has been dubbed the ‘low-frequency universe’. What makes LOFAR different from traditional telescopes is the fact that the antennae are Omni-directional they can record the entire sky at once. Then, in order to observe a particular spot in the sky, the signals from all the antenna are collected and the aperture actually defined within the software, using a supercomputer that cleverly processes the signal received by each of the antennae. Although it still requires antennae to do the receiving, LOFAR is basically a digital telescope that has only been made possible through modern computing — the power and sophistication of which will only improve over time. Like ALMA, LOFAR is a fantastically powerful and innovative telescope that is going to help revolutionize twenty-first-century astronomy. One of the goals of LOFAR is to detect the 21 cm line of neutral atomic hydrogen close to the epoch when the first stars and galaxies formed, where the H1 emission has been redshifted to very low frequencies — this is the final frontier of galaxy evolution studies. LOFAR has a more practical application too: it is also being used as a sensor network that can be applied to geophysics research and agriculture studies. 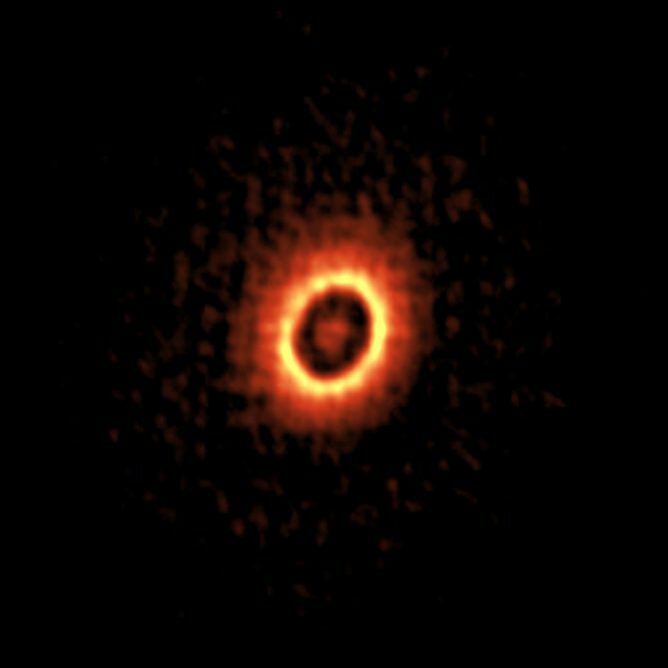 ALMA image of the dusty disk around the young star DM Tau. You can see two concentric rings where planets may be forming. Credit: ALMA (ESO/NAOJ/NRAO), Kudo et al. These results were published as Kudo et al. 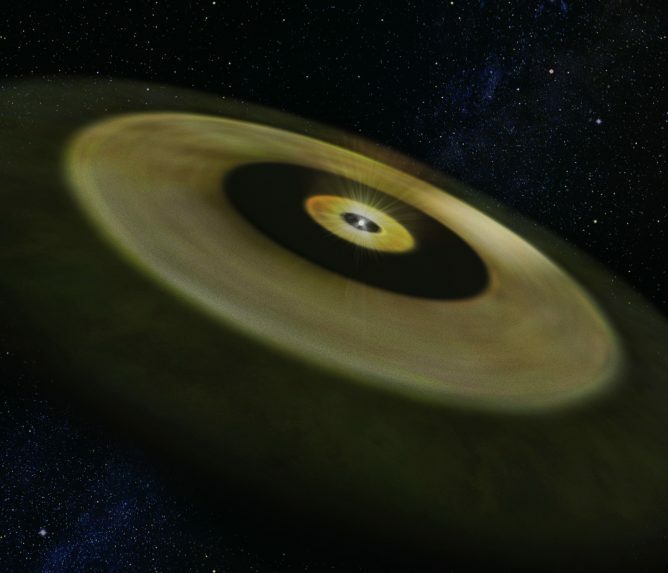 “A Spatially Resolved au-scale Inner Disk around DM Tau” in The Astrophysical Journal in November 2018 and presented at the annual meeting of the Astronomical Society of Japan in March 2019. This montage shows three views of the distant group of interacting and merging galaxies called SPT2349-56. The left image is a wide view from the South Pole Telescope that reveals just a bright spot. The central view is from Atacama Pathfinder Experiment (APEX) that reveals more details. The right picture is from the Atacama Large Millimeter/submillimeter Array (ALMA) and reveals that the object is actually a group of 14 merging galaxies in the process of forming a galaxy cluster. Credit: ESO/ALMA (ESO/NAOJ/NRAO)/Miller et al. These forming galaxy clusters were first spotted as faint smudges of light, using the South Pole Telescope and the Herschel Space Observatory. Subsequent ALMA and APEX observations showed that they had unusual structure and confirmed that their light originated much earlier than expected — only 1.5 billion years after the Big Bang. “These discoveries by ALMA are only the tip of the iceberg. Additional observations with the APEX telescope show that the real number of star-forming galaxies is likely even three times higher. 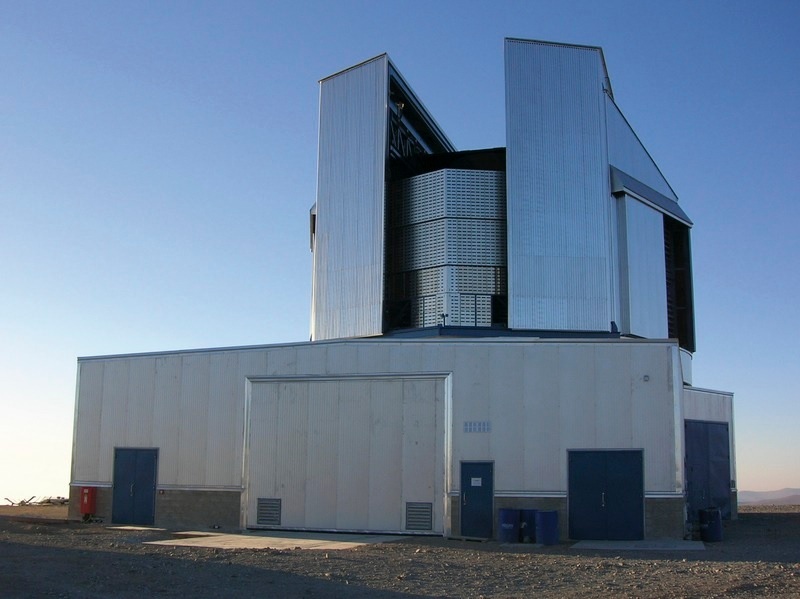 Ongoing observations with the MUSE instrument on ESO’s VLT are also identifying additional galaxies,” comments Carlos De Breuck, ESO astronomer. “How this assembly of galaxies got so big so fast is a mystery. It wasn’t built up gradually over billions of years, as astronomers might expect. This discovery provides a great opportunity to study how massive galaxies came together to build enormous galaxy clusters,” says Tim Miller, a PhD candidate at Yale University and lead author of one of the papers. 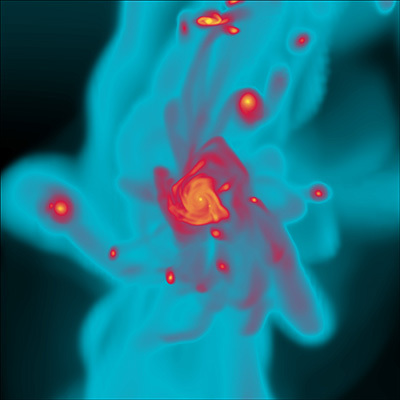 This research was presented in two papers, The Formation of a Massive Galaxy Cluster Core at z = 4.3, by T. Miller et al., to appear in the journal Nature, and An Extreme Proto-cluster of Luminous Dusty Starbursts in the Early Universe, by I. Oteo et al., which appeared in the Astrophysical Journal. Light from the first galaxies clears the universe. ESO/L. Calçada. Not long after the Big Bang, all went dark. The hydrogen gas that pervaded the early universe would have snuffed out the light of the universe’s first stars and galaxies. For hundreds of millions of years, even a galaxy’s worth of stars — or unthinkably bright beacons such as those created by supermassive black holes — would have been rendered all but invisible. Eventually this fog burned off as high-energy ultraviolet light broke the atoms apart in a process called reionization. But the questions of exactly how this happened — which celestial objects powered the process and how many of them were needed — have consumed astronomers for decades. Now, in a series of studies, researchers have looked further into the early universe than ever before. They’ve used galaxies and dark matter as a giant cosmic lens to see some of the earliest galaxies known, illuminating how these galaxies could have dissipated the cosmic fog. In addition, an international team of astronomers has found dozens of supermassive black holes — each with the mass of millions of suns — lighting up the early universe. Another team has found evidence that supermassive black holes existed hundreds of millions of years before anyone thought possible. The new discoveries should make clear just how much black holes contributed to the reionization of the universe, even as they’ve opened up questions as to how such supermassive black holes were able to form so early in the universe’s history. 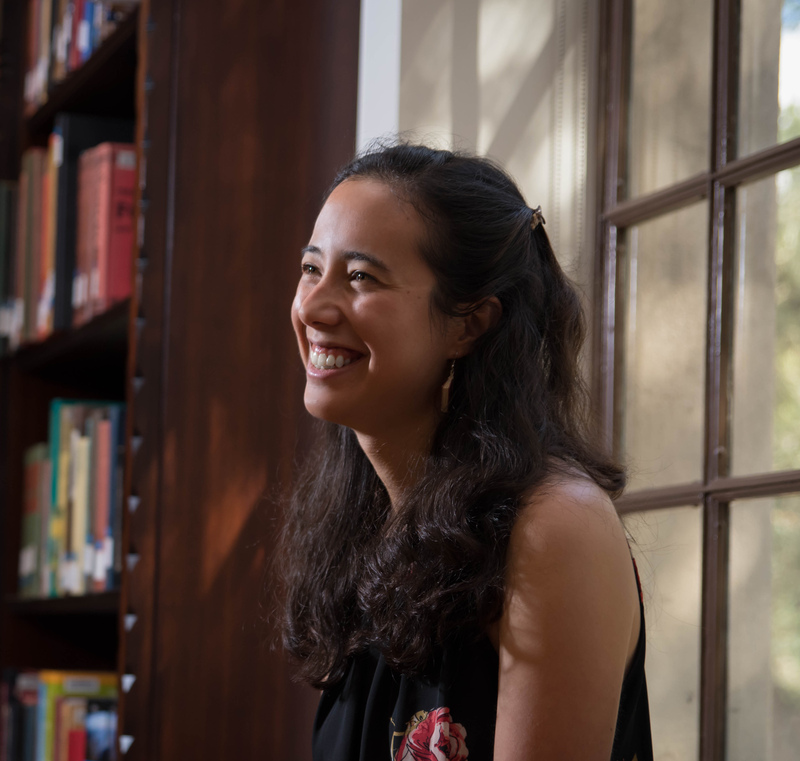 A team led by Rachael Livermore, an astrophysicist at the University of Texas at Austin, found just the help needed in the form of a giant cosmic lens. These so-called gravitational lenses form when a galaxy cluster, filled with massive dark matter, bends space-time to focus and magnify any object on the other side of it. Livermore used this technique with images from the Hubble Space Telescope to spot extremely faint galaxies from as far back as 600 million years after the Big Bang — right in the thick of reionization. Yet there’s a catch. Astronomers doing this work have to estimate how much of a star’s ultraviolet light escaped its home galaxy (which is full of light-blocking hydrogen gas) to go out into the wider universe and contribute to reionization writ large. That estimate — called the escape fraction — creates a huge uncertainty that Livermore is quick to acknowledge. The trick is finding enough quasars to do it. In a paper posted to the scientific preprint site arxiv.org last month, astronomers working with the Subaru Telescope announced the discovery of 33 quasars that are about a 10th as bright as ones identified before. With such faint quasars, the astronomers should be able to calculate just how much ultraviolet light these supermassive black holes emit, said Michael Strauss, an astrophysicist at Princeton University and a member of the team. The researchers haven’t done the analysis yet, but they expect to publish the results in the coming months. This is why another recent discovery [The Astrophysical Journal] is so puzzling. A team of researchers led by Richard Ellis, an astronomer at the European Southern Observatory, was observing a bright, star-forming galaxy seen as it was just 600 million years after the Big Bang. The galaxy’s spectrum — a catalog of light by wavelength — appeared to contain a signature of ionized nitrogen. It’s hard to ionize ordinary hydrogen, and even harder to ionize nitrogen. It requires more higher-energy ultraviolet light than stars emit. So another strong source of ionizing radiation, possibly a supermassive black hole, had to exist at this time, Ellis said. His work — and all work involving the universe’s first billion years — will get a boost in the coming years after the 2018 launch of the James Webb Space Telescope, Hubble’s successor, which has been explicitly designed to find the first objects in the universe. Its findings will probably provoke many more questions, too. ALMA Captured Betelgeuse Credit: ALMA (ESO/NAOJ/NRAO) /E. O’Gorman/P. Kervella. ALMA captured this image of the bright star Betelgeuse in the constellation Orion at an ultra-high resolution which exceeds 80000/20 vision in terms of eyesight. Betelgeuse is a red supergiant star in the final stage of its life. It has swelled up to about 1400 times bigger than the Sun. In the image taken by ALMA, the radio waves are stronger on a part of the star’s surface (the white part in the image), and it turned out that that part was about 1000 degrees Celsius hotter than its surroundings. Also on the left side of the image, a slightly swollen structure can be seen. The stars visible in the night sky are located very far away. Even if you look at the stars with a telescope, you usually can only see them as dots. However, Betelgeuse is located relatively close at 500 light-years from the Earth, and it has expanded to 1400 times as big as the Sun, which is about the same size as Jupiter’s orbit in the Solar System. So, it is one of the few stars where we can investigate the surface pattern with extremely high-resolution observations. 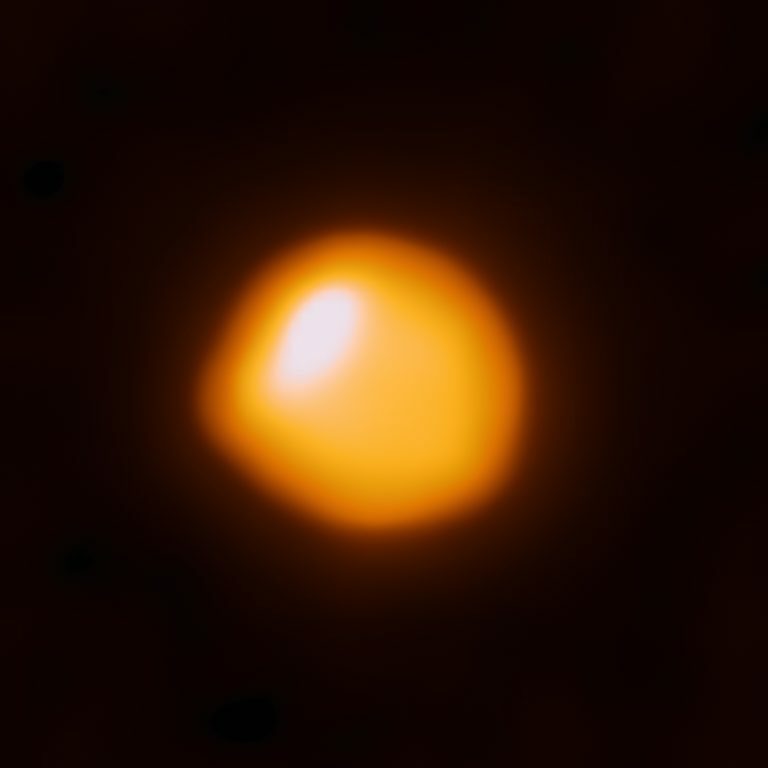 ALMA captured radio waves radiated slightly above the photosphere, the surface of Betelgeuse which you can see with visible light. The average temperature estimated from the radio intensity is about 2500 degrees Celsius. Since Betelgeuse’s photosphere is about 3400 degrees Celsius, we can say that the temperature of the upper atmosphere is about 1000 degrees Celsius colder than the surface of the photosphere. On the other hand, as shown in the image, some regions captured by ALMA are hotter than the surroundings. Researchers think that this is due to a convection phenomenon in which high temperature matter comes up from inside Betelgeuse. Observing Betelgeuse in extremely high-resolution gives us a clue to understand what is happening inside the giant star at the end of its life. 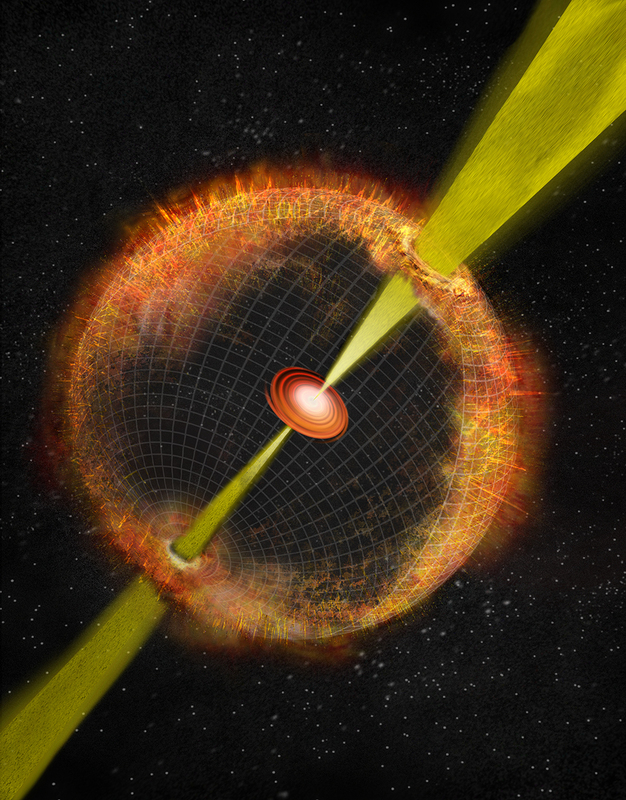 Artist’s impression – Credit: Amanda Smith, University of Cambridge. 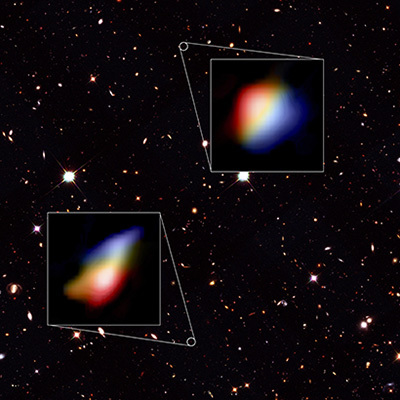 Data visualization – Hubble Telescope image of the night sky where the galaxies were found and two zoomed in panels of the ALMA data. Credit: Hubble (NASA/ESA), ALMA (ESO/NAOJ/NRAO), P. Oesch (University of Geneva) and R. Smit (University of Cambridge). 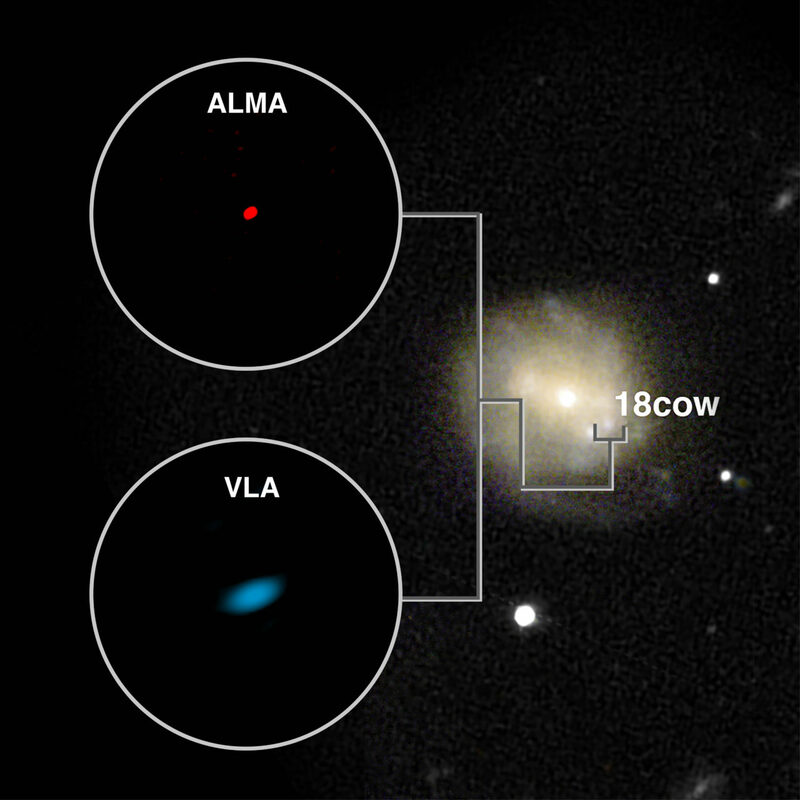 Smit and her colleagues used ALMA to observe two small newborn galaxies, as they existed just 800 million years after the Big Bang. By analyzing the spectral ‘fingerprint’ of the far-infrared light collected by ALMA, they were able to establish the distance to the galaxies and, for the first time, see the internal motion of the gas that fueled their growth. A video simulation of rotating disc. Credit: R. Crain (LJMU) and J. Geach (U.Herts). The data from this project on small galaxies paves the way for larger studies of galaxies during the first billion years of cosmic time. The research was funded in part by the European Research Council and the UK Science and Technology Facilities Council (STFC).